Down syndrome, also known as Trisomy 21, is a genetic disorder that results from an excess copy of chromosome 21. It is often associated with physical and intellectual impairments, although the degree to which the child is affected can vary greatly. With early intervention many children with Down syndrome grow to be independent adults. It affects children of all races and socio-economic statuses, and affects both males and females equally. The estimated prevalence is around one in every 860 births. Typically at conception, children inherit 23 chromosomes from their father and 23 chromosomes from their mother. However, kids with Down syndrome inherit an extra copy of chromosome 21, resulting in the possession of a total of 47 chromosomes rather than 46. The exact cause of this defect is unknown, although studies have suggested that women over the age of 35 have a greater risk of having a child with the condition. What are the difficulties associated with Down syndrome? Down syndrome is associated with both physical and intellectual disabilities. Physically children may have low muscle tone, which may cause them to reach developmental milestones such as sitting and crawling at a later age than their typically developing peers. This disorder is also associated with various other medical conditions such as thyroid problems, intestinal abnormalities, respiratory problems and obesity. It is thus recommended that children with Down syndrome are closely monitored by their general practitioner. Down syndrome affects a child’s ability to learn in various ways and most children with this condition have a mild to moderate intellectual impairment. It is often believed that children with Down syndrome plateau in their learning in their teenage years, but studies have shown that this is false and these children continue to learn and develop throughout their lifetime. In particular, kids with Down syndrome have difficulties with working memory, mathematics and expressive language. Children with Down syndrome are typically able to adhere to the same behavioral and social norms that are expected of their peers. Maintaining high expectations in these areas will assist the child in reaching their full potential and have successful relationships with their peers. Many children with Down syndrome enjoy interacting with their peers and should be given opportunities to develop relationships with children who are typically developing and have Down syndrome. Since Down syndrome is often associated with learning difficulties, it is important to break learning into smaller components, and to reinforce these ideas. Provide opportunities for repetition where possible. These children typically have strengths in the areas of visual memory and visual processing. Therefore, it may be helpful for concepts, especially in mathematics, to be illustrated in a concrete visual way (e.g. through the use of blocks etc). It may also be useful to use the concept of mastery, when teaching children with Down syndrome. This is where the child must demonstrate competence with the current concept before moving onto learning the next one. Teaching errorlessly has shown to be of most benefit to children with Down syndrome. This is where the child is given prompts so that they are able to successfully achieve the task from the outset. It is recommended that the prompts are in the form of a scaffold of steps for the task, so that the child is able to experience independent learning which in turn will develop their sense of self-competence and self-esteem. Speech and language development is usually an area of difficulty, and is usually affected by hearing impairments in children with Down syndrome. They often understand more words than they are able to produce, and therefore having other means by which they can communicate (e.g. picture exchange systems or sign language) can be useful. This will also reduce the impact that delayed speech has upon their learning and potentially mitigate disruptive behaviors that result for an inability to communicate. Children with Down syndrome more often than not also often have difficulty in their working memory skills. This refers to our ability to hold information in our memory in a readily available and accessible state for a short period of time. These skills contribute to our ability in following conversations and problem solve etc. 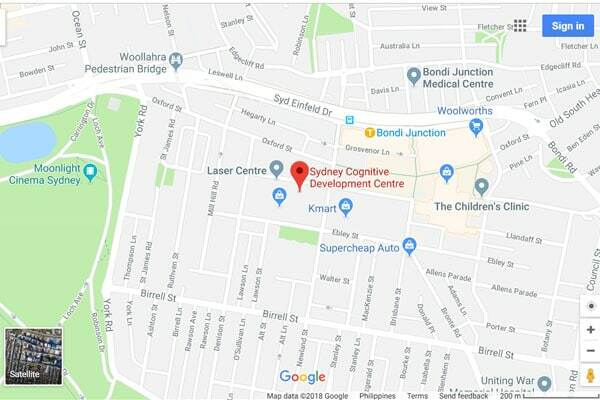 Here at the Sydney Cognitive Development Centre we have a HighQ cognitive development program which is aimed at improving working memory and other cognitive skills. To discuss whether this program would be beneficial for your child please feel free to give us a call. Individuals with this disorder often have difficulty processing large amounts of verbal information due to their auditory and working memory difficulties. It is therefore important to keep instructions given to Down syndrome learners as short as possible, and make sure that they have understood. It may also be helpful to give these children a pictorial or written list that they can refer to, to make sure that they have heard all components of the instructions. Due to the gross and fine motor impairments that are associated with Down syndrome, children may find it difficult to manage activities and tasks such as skipping, climbing, writing and doing up buttons/zippers etc. It is recommended that children with this disorder see a physiotherapist and/or occupational therapist to develop these skills. Many children with Down syndrome exhibit sensitivity to failure. It is therefore important that tasks are broken down into smaller manageable steps, and that praise is given whenever it is possible so that the child is able to experience success in their learning.